I hope you always knew how much I loved you. All I ever wanted was for you to be happy and healthy. You almost always were happy, however, you were also almost always sick. For 9 years we struggled together with bloody tinkle, recurrent bladder stones, recurrent UTIs, multiple broken teeth, transient Fanconi Syndrome, allergies, dry eye, terrible medicine skin reactions, brittle toenails, specialists, tests, surgeries, procedures, medicines, supplements, home injections, and self-mutilation of your back foot. I would have given everything I have to help you, if it would have fixed you. Yesterday was a tragic day, as it was the day I lost all hope in you ever fully getting better. I’m so sorry it came down to that. I wanted so much to have you for so much longer. I have no regrets in all the work, emotional turmoil, and expense that I and Dr Deason put into getting you to 9 years and 8 months. You were worth it, and I would do it all over again. …when my mom, Zoe, and I drove all the way to the Oklahoma/Arkansas border to get you at that weird place with all those dogs. You were so feisty and crazy, and I loved your brindle markings. …how smart you were. You potty trained after one accident. You figured out the dog door immediately. You learned so quickly. …how you were the fastest dog at the dog park. You were the lead chaser every time. I loved to sneak away from you and then call to you from across the park and watch you run to me at 100 mph. ...how you would bring me a pair of rolled up socks when you wanted me to take you on a walk. ...the time I took you to a dog fair, and the person working the dog treadmill said you did it better than any other dog all weekend. ...how you would hide behind me when you were scared. ...the handful of kisses you gave me over 9 years. ...eye contact for you with the vet (Dr. Deason) was never a possibility. ...your profound ability to catch food mid-air. ...the time Mitch and I took you and Zoe to Possum Kingdom Lake. The life jacket didn’t bother you one bit, and you LOVED going out on the boat, and you equally hated getting in the water. ...taking you to dog training when you were 7 years old. You were the oldest dog there, and one of the best students. ...how you didn't like new people in the house, but after you got used to them, you like to stand on their chest and look them right in the face. ...the time you caught that squirrel that was hiding in a bush (the horror). And you had several other run-ins with a variety of critters that I can’t ever forget – raccoons, ‘possums, armadillos, kitties, etc. ...your absolute hatred of the vacuum, the plunger, the weedeater. ...the time I set you up as the victim of a practical joke. I placed a stuffed squirrel out on the back deck, started screaming “Squirrel, Squirrel!!!... you saw the squirrel and made an immediate move to the door, I let you out and you ran like heck to get to the squirrel... so fast you actually overshot it and flew off the side of the deck. ...your guard dog qualities. You heard everything, and despite your size, I always felt safe with you around. ...how you loved to put your head out the window while in the car. ...your adventurous spirit and what it brought to my life. ...all the times you made me laugh (which was often). ...you scratching the top of the covers in bed so I would lift them up so you could crawl under. ...naps with you and Zoe in bed on weekend afternoons. ...your pathetic apologies when you got in trouble. Who could stay mad at you when you seemed THAT sorry? ...your wagging tail when I got home from work. ...”the paw” - Your not-so-subtle indication that you wanted some attention. ...watching you play, dig, splash in your little plastic pool. ...you lying behind my bent knees while we lay on the couch, with your head resting on my legs. ...your big, beautiful brown eyes. ...your constant presence underfoot while I cooked in the kitchen. You always had hope that I would drop something. ...my Abby alarm. You never, ever in 9 years let me sleep past 7 AM because you had to have your breakfast. ...holding you like a baby in my arms. ...your uncanny ability to roll down the window in the back seat. I swear you knew what you were doing. ...finding you laying on your back, all four feet in the air, taking a nap. ...playing fetch and watching you run. But mostly I will miss our walks together, just the two of us. You never tired out. At 9 years of age, you could still go as hard, as long, and as fast as you ever did. More than anything, I will miss those special times you and I shared. You loved walking so much, and it made me happy to see you happy. Going on walks will never be the same without you. Thank you so much for 9+ wonderful years. I hope you weren’t in pain and suffering. If you were, thank you for being so stoic and never showing it. I hope you know all the vet visits, and shots, and procedures, and tests were all done out of love. I just wanted to have you as long as I could. I miss you terribly. I don’t know how that void can ever be filled. Your cairn terrier was like so many other Cairns--smart, playful, watchful, fast on its feet and in charge of the household. My Big Daddy could roll down the window in my car, as well. Ran like the wind. Never tired of playing ball or running either. Believe me, I know your pain too well, and I know it lasts far too long. After 23 Cairns of my own, and having lost my own very dear and precious angel just last month (she died in my arms after several hard days of being unable to breathe, and she endured as many attempts to resuscitate her), I know how there is no comfort in coming home to an empty house when a cairn terrier once lived in it with you. While it hurts so deeply as it does (and I will swear, more so than it does for many other dog owners due to the Cairn being so remarkable a companion) you should perhaps consider getting another Cairn Terrier. She will never replace the one you lost, none could, but you'll love her dearly in no time at all--and she you. You deserve to have that companionship in your life, and so does the next Cairn Terrier. More importantly, she will fill the terrible emptiness you must be feeling from her loss, that dark void in your life that likely swallowed you whole in the days after your sweet baby died. You owe yourself the opportunity to love another Cairn Terrier, and you should do just that--perhaps to honor the memory of your darling dear, who you so rightly cherished. To all who have lost someone so wonderful and dear, please don't let another day pass without finding a place in your hearts for another dog. There are rescues a plenty, and puppies too, all of whom need homes that someone like you could so readily provide. I have one who just came to me, and I have no doubt how she was meant to find me. Nor how I was meant to find her. There's nothing quite like a dog as one's faithful companion. And, there's no dog quite like a cairn terrier. It's so sad when you have to give up your best friend. 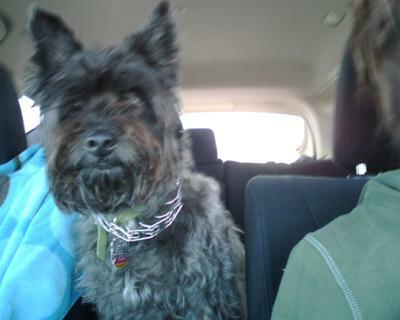 I still miss my little cairn terrier months later, will miss her forever, until we meet again at the rainbow bridge. Time does not seem to heal. I miss her so so much. This year, there seem to be lots of Poppy flowers in the garden. I'm not sure if this helps or makes me cry. OMG, I know how you feel. How strange that I should wake up this morning thinking about my Jake (Cairn) 5 years after losing him, and then randomly finding this on the net whilst looking for something totally unrelated this evening. I'm not going to say anything else, except that I'm 51, and a tough old biker (or so I thought) but now crying - which says it all! I'm sorry for your loss, and I hope you can find a way of suppressing it - but of course we both know that that's not going to be easy. I lost my beloved Riley a week ago to Fibrosis of the lung. My love was real. My heart aches so much. I cry so much. He was only 8 years old. God help me now. Loved him so much. Thank you for bringing back some wonderful memories of my own. A lovely and insightful read. You remind me of how I was with my Riley who died in April. It doesn't get any easier losing them. I still cry after 5 months. My heart is with you during your grieving.